1. 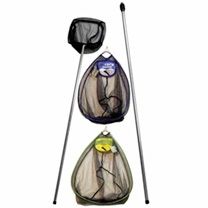 Mini Carp Net - 20cm (8") diameter x 15cm deep (6"), extra mesh with fitted 90cm (36") handle. 2. Fine Soft Mesh - 35cm (14") diameter x 30cm (12") deep, with fine mesh soft net. 3. Koi Net - 38cm (15") diameter x 25cm (10") deep, with extra soft net. Perfect for larger fish. An invaluable net set for anyone with a pond!